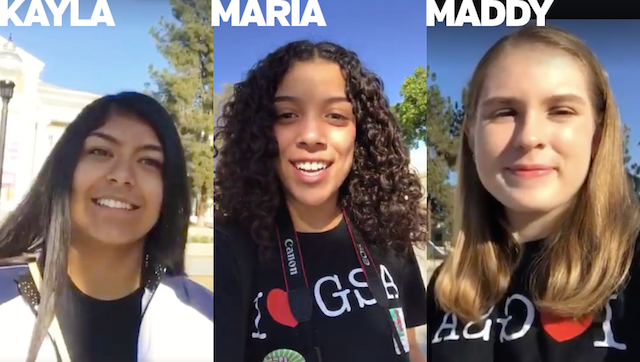 By Maria L., Kayla G., and Maddy F.
This year, three young people formed a Youth Media Team and took over GSA Network’s Twitter and Instagram accounts to catch the action. If you missed #ENS2018 or if you just want to relive some of this year’s moments, check out their photo story below. ENS 2018’s Youth Media is part of an ongoing series to build up the capacity of GSA Network and the young folks we work with to provide space, opportunity, and skills to have a greater impact on the narrative surrounding youth trans and queer folks. Oftentimes, our stories get told by allies, reporters, and other types of media outlets. Rarely do we get a chance to speak to our own experiences or show the world through our own eyes. Check out our day at ENS and follow us as we develop out this series on Instagram, Twitter, and Facebook. *GSA Network California youth council members, event attendees, and GSA leaders who are interested in joining a youth media team should contact us to find out what opportunities might be available. ENS 2018 was the biggest year ever thanks in part to a collaboration with Fresno Unified School District (FUSD). They provided a space for the event at Fresno High School. When schools support trans and queer young people, whole communities thrive. ENS provides a space for young people and adult allies to collaborate in order to educate, uplift, and empower youth movement work. Workshops this year ranged from LGBTQ History to Sexual Health to Digital Organizing. This year’s keynote speaker, Leilani Price, is a well-known community advocate in the Central Valley. Leilani is also the 42nd Empress for the Imperial Dove Court of Fresno and supports the community through Drag Queen story hour and LGBT Prom.